Sheida Soleimani is a Cincinnati-born artist and University of Cincinnati, DAAP alum. Her work has been exhibited across the United States and Europe. 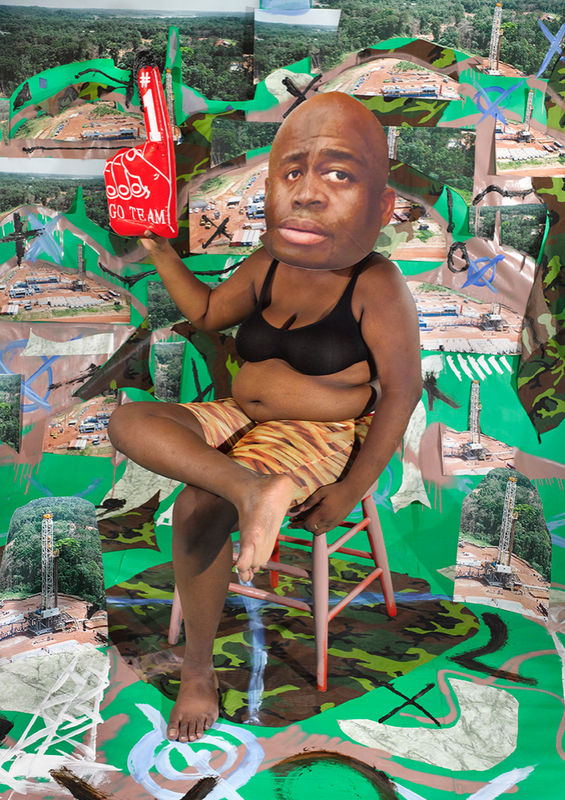 Soleimani’s photographs of collaged and staged scenes prompt dialogue around the corruption in the oil industry. Her latest work, Medium of Exchange is a performance that delves further into this topic by drawing from archived conversations between government officials, the news, photographs, and speeches. Below, Soleimani answers a few questions about her work and new performance. Medium of Exchange (Still). 2018. Image courtesy of the artist. For context, can you briefly describe how your identity and early experiences as an Iranian-American influence your work? Growing up as an Iranian in America has informed how I perceive things on a daily basis. I didn’t learn how to speak English until age 6, and I spent most of my time listening to my mother’s stories about what Iran was like, as well as participating in activities that spanned the bridge between my mother’s stories and events in real life. At the same time, however, I was being raised in America, and western influences seemed to always find a way to sneak into my life. The duality in culture never really became apparent to me until I got a bit older, and once I realized their influences upon my life, I tried my very hardest to deny them. Through referencing the breaks in my cultural identities, my work has always been an attempt at highlighting these fractures alongside the multiplicity of media sources that informs our society. I read in an earlier interview that in undergrad you made more personal work, was it hard to let go of that intimacy? What feels more vulnerable, the political or the personal? I still consider my work ‘personal’ (also, I really hate that buzz word as a means of describing art). The topics have just departed from familial to more global. What is your experience with making art about a country that you are cut off from and yet inextricably bound to? Is the paradox something you feel you ignore, overcome, or use when researching and making these images. How could I ignore it? It would be so irresponsible if I did. Knowing that I have the freedom to speak freely about injustices within Iran and the Greater Middle East without having to face imprisonment or torture initiates me to research my topics in depth- via speaking to individuals inside and outside of the country, compiling news sources, and chronicling oral histories. How do you go about creating a composition? When choosing objects or photos do you improvise during the process or is it predetermined? I wish I could say I improvised, but I don’t do that often at all. I start with researching each topic, then create a list of symbols and visuals that corresponds to the narrative. Then I do hundreds of sketches of how these objects can play out amongst one another, then build the set, and then stage it and photograph it. What inspired you to move into performance from your previous art practice? The photographs are so performative, that I thought that perhaps a second approach to communicating these stories could come through dialogue. It seemed like a natural transition and accompaniment to the photographs. What was your process behind the research for “Medium of Exchange”? Were there any roadblocks to gaining information? Reading stories from every possible and available news source writing on the countries and topics I was exploring. Fox News vs CNN vs BBC vs AL Jazeera vs RT etcetc. Outside of just reading news, I spent a lot of time putting together timelines for the past century of history in each of these spaces and trying to understand each countries relationship to the West. Oh, and lots of exploring the cia.gov archives. Bigger sets and more complex scenes. I want to learn how to do more elaborate set design. Read Annabel Biernat's Review of Sheida Soleimani's performance here.